The stars aren't exactly blowing me away with their bag choices this week, but there are still a few celeb picks worth peeping at in this bag roundup, including a brand new Chanel bag that we've only seen on the arm of a celeb once before. (Hint: it's not a Chanel Boy Bag) Celebs are still falling back on old favorites, some of which are properly vintage, some of which are just a few seasons old. Spring 2015 bags have been in stores for a few weeks now though, so maybe we'll see a little more variety in next week's batch of bags. Courtney Love was recently spotted leaving dinner at Craig's in West Hollywood with one of Stella McCartney's most beloved bags. Courtney is actually prepping to head out on tour once again--she'll be opening for Lana Del Rey, of all people, which makes perfect sense, in a logic-defying sort of way. Here's Oprah's bestie Gayle King, arriving at a screening of the Mad Men season premiere in NYC with a cute little Rebecca Minkoff. I like Mad Men too, Gayle! Maybe we should hang. If Oprah's there too, that's cool. Giada carried this colorfully customized Goyard tote to the Today show studios. 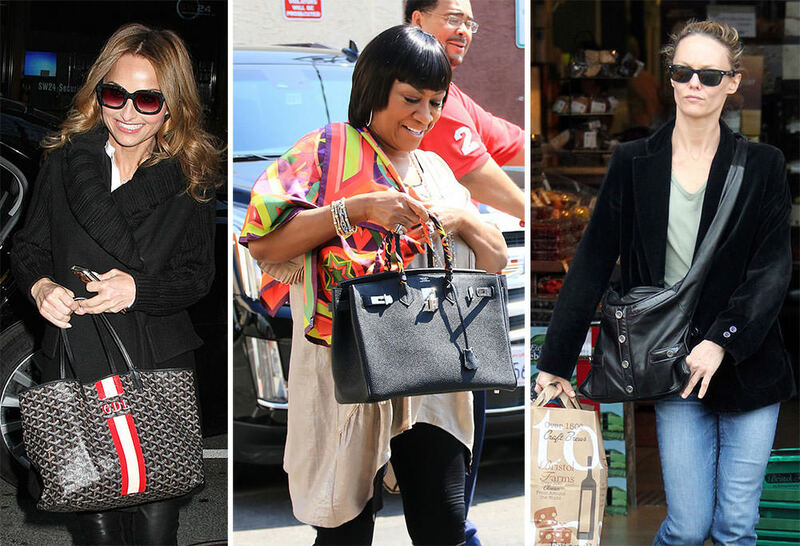 Goyard's personalized totes are, of course, a huge part of the brand's appeal--celebs and regular customers alike snap them up. Here's Italian TV personality Miriam Leone attending a photo call for the Italian TV series 1992 in Rome. She's carrying a dainty Salvatore Ferragamo mini. Naya Rivera loves vintage Hermès and Chanel, and those two brands represent the vast majority of what she chooses to carry on a daily basis. Here's Naya, catching a flight at LAX with her vintage Kelly. Now that Glee is officially over, we no longer have to speculate about her level of involvement with the show, which is something of a relief. Here's fellow vintage lover Nicky Hilton, carrying vintage Chanel to the premiere of Serena in NYC. Nicky attends movie premieres in NYC like it's her job. If you're premiering a movie, tell your publicist to invite Nicky; she will bring a little extra press along with her (and a fab bag, of course). Ladies and gents, I have been a little harsh towards the DWTS cast in recent weeks. They do have at least one legitimate star on this season's cast: Ms. Patti LaBelle! I don't know why they didn't lock Patti down several seasons ago. 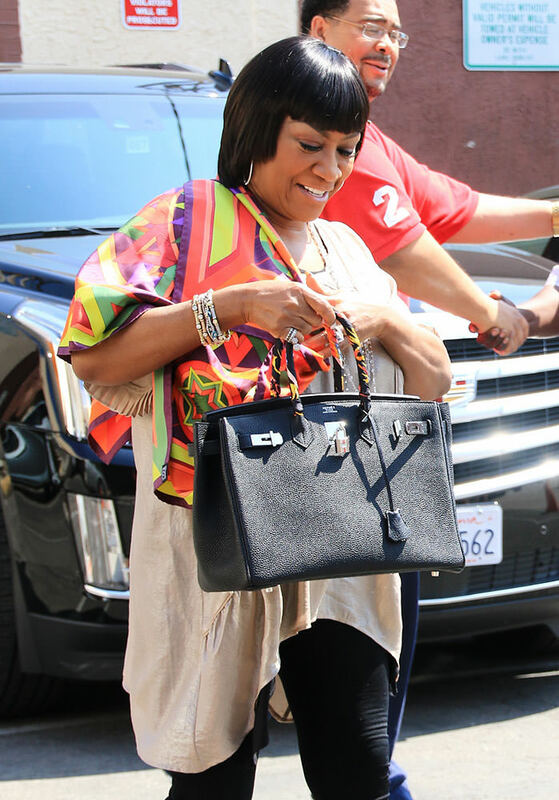 Here she is, leaving DWTS rehearsals with her black Hermès Birkin. Here's Vanessa Paradis, leaving Bristol Farms, one of the top celeb-shopping/celeb-sighting spots in LA, so far as I can tell. Vanessa is carrying one of Chanel's most unusual bags of the last few seasons, the Chanel Girl Bag. FYI, this bag just hit stores, along with the rest of Chanel Spring 2015 collection.